We ran a big story on Black Friday Weekend bargains from a dozen leading vendors. GET THAT INFO HERE. While some of the listed bargains expired, many of those deals are still in effect. Here are some more specials good now (Sunday 11/25/18) and beyond. While most of these specials expire at 11:59pm on Monday 11/26/18, some extend into early December. Please check each deal for specifics. Now through November 30, 2018, save 15% on all TargetVision Camera systems. We think these are some of the most sophisticated wireless target imaging systems you can buy. These really do work at 1000 yards and below. The software is reliable and will display your shots on your favorite mobile device. In addition, you can get a TargetVision Cam + LabRadar bundle with 2-year “bullet proof” TargetVision warranty. The Optics Planet Black Friday Sale is good through Monday, 11/25/2018 at 11:59 pm. Use Code BFCYBER to save 11% on virtually everything in stock, including highly desired Kowa spotting scopes, Nightforce scopes, Leica Rangefinders, Vortex scopes and more. In addition, there are special deeper discounts on 126 featured products, listed at up to 61% off. These include gun cases, buttstocks, magazines, pistol sights, ear-muffs and more. 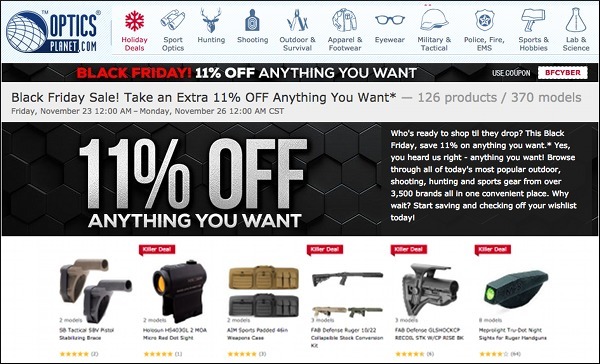 But the big deal is being able to get that exact scope you want at 11% off normal retail. 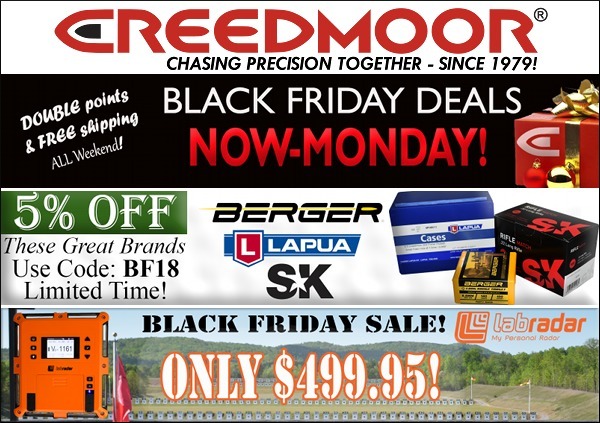 Creedmoor Sports has extended its Black Friday Sale through Monday 11/26/2018 at 11:59 PM. There are some great products on sale, including Berger Bullets, Lapua Brass, SK Ammo, Kowa Spotting Scopes, and the state-of-the-art LabRadar Chronograph. See other General Sale items HERE (some special items will be on sale past Monday). 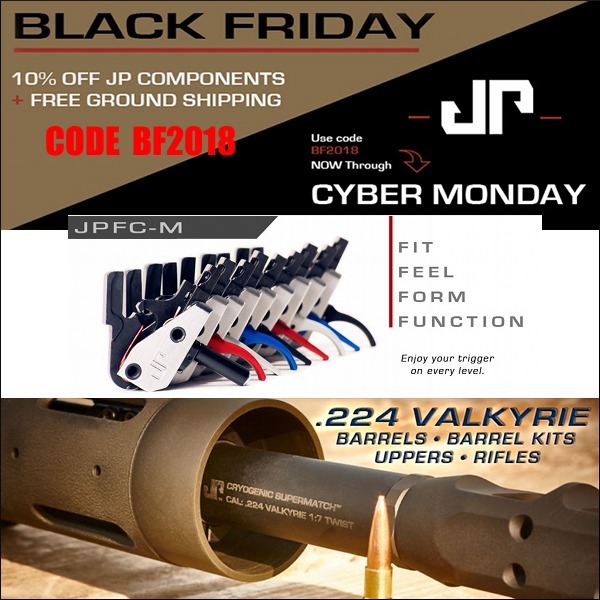 JP Enterprises, a leading producer of AR-type rifles, uppers, trigger groups, and accessories, has extended its Black Friday special through Monday 11/26/18 at 11:59 PM. With this Cyber-Sale, you can save 10% on high-end MSR (Modern Sporting Rifle) components, handguards, trigger groups, as well as cartridge brass. This deal also includes free ground shipping in the lower 48. Hunters rejoice. Steyr Arms is running a big sale on Steyr Products and Jaghund hunting gear. Save up to 35% on hardware and up to 70% on clothing. 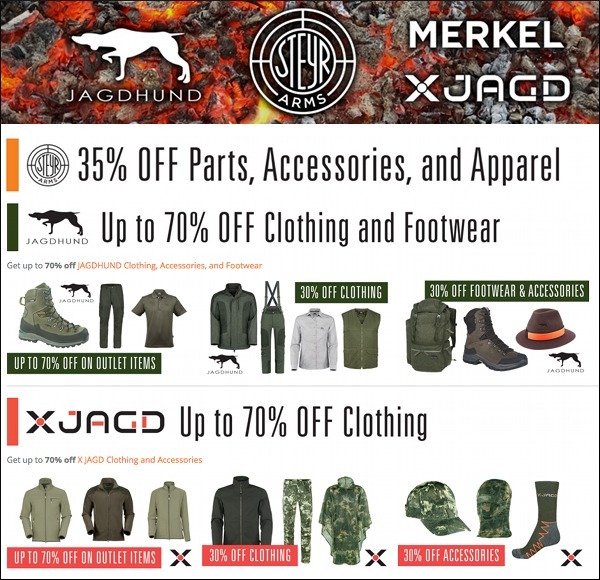 This sales runs through 26th, 2018 with great savings on Steyr, Merkel, JAGDHUND, and X JAGD products. Christensen Arms has slashed prices on a full range of components and accessories: barrels, stocks, muzzle brakes, AR uppers, Timney triggers, bipods, gun cases and more. See Sale Items HERE. Sales Located by EdLongRange. We welcome reader submissions. Share the post "More Deals for Black Friday through CyberMonday and Beyond"